In a battle between two gaming giants, only one is the best bet for your investment dollars today. Las Vegas Sands (NYSE:LVS) and Wynn Resorts (NASDAQ:WYNN) are two of the biggest gaming companies in the world. Both have resorts in Las Vegas and Macau, with Las Vegas Sands adding a Singapore resort that was one of the biggest concession wins in the history of the industry. Today, Las Vegas Sands is the much bigger, more stable operator, with a big 5.1% dividend yield for investors. But Wynn has a chance to be a great investment, too, if its growth projects perform as well as Steve Wynn hopes. Front view of The Parisian in Macau. Image source: Las Vegas Sands. One of the ways we can gauge value in gaming is by looking at enterprise value (EV) compared to earnings before interest, taxes, depreciation, and amortization (EBITDA). In other words, we take total equity value and debt, and divide it by an approximation of cash flow coming from resorts. And as you can see below, Wynn has a much higher EV/EBITDA ratio than Las Vegas Sands. 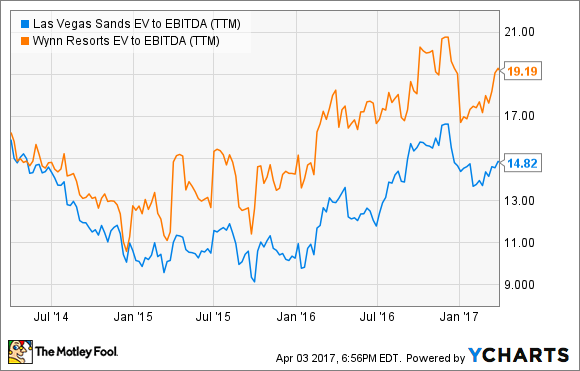 LVS EV to EBITDA (TTM) data by YCharts. One big reason Wynn trades for a higher multiple is its growth opportunities, and they're already beginning to impact results. Las Vegas Sands opened The Parisian in Macau last summer, which is the last resort it had in its pipeline. But this property will add to six major resorts in Las Vegas, Macau, and Singapore, so it will only be an incremental help to operations. Wynn completed Wynn Palace shortly after The Parisian opened, adding one resort to just two it had in operation. And Wynn Palace will likely be its best-performing resort when operations get up to speed. In the fourth quarter of 2016, revenue at Wynn Palace was $418.7 million, compared to $498.4 million at Wynn Macau and $383.3 million at Wynn Las Vegas. In a few quarters, Wynn Palace will likely be the company's highest-earning resort, and probably its most profitable as well. This one resort should add more than 50% to revenue and EBITDA, justifying the premium I pointed out above. Wynn Palace isn't the only growth opportunity. Wynn Boston Harbor is under construction now, and ground is expected to be broken on Paradise Park, in Las Vegas, this year. Neither project will be done for a couple of years, but they'll incrementally add to revenue in future years. While Wynn has a lot of growth opportunities ahead, that growth comes at a cost. Wynn Palace cost $4.4 billion to build and $2.2 to $2.4 billion will be spent on Wynn Boston Harbor. Paradise Park could cost another $1.5 billion, if approved by the board of directors, and most of that construction cost is being paid for with debt. Las Vegas Sands doesn't have the same leverage problem because its massive construction build-out happened from 2005 to 2015. Now, it's collecting cash flow from existing properties and managing the debt load already on the balance sheet. This allows for less leverage and a more favorable dividend, which has a 5.1% yield. If the gaming industry turns south, Las Vegas Sands' rock solid balance sheet will be a big advantage. And that stability could outweigh the growth Wynn Resorts has ahead. The future of these two stocks will depend a lot on gaming revenue in Asia, particularly Macau. If Macau grows, Wynn will increase its market share with Wynn Palace and stockholders will be big winners, given its much higher financial leverage. On the flip side, if Macau were to head into another tailspin, Wynn could be in trouble if it added too much debt to build out new resorts. 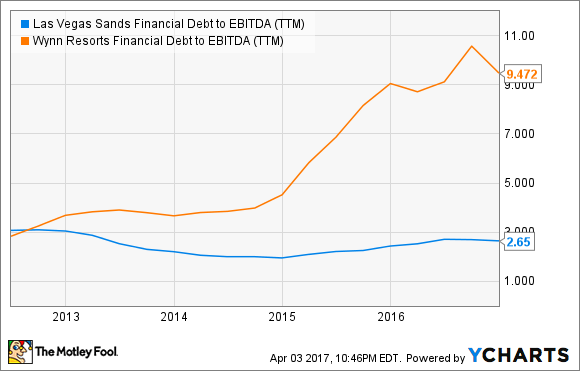 Las Vegas Sands doesn't have any major growth plans, but is clearly the more stable company, with more resorts and less debt in comparison to EBITDA than Wynn Resorts. And the dividend is a nice flow of cash for investors as well. While I like Wynn's growth opportunities, it's a high-risk stock given its leverage and high EV/EBITDA multiple. I think Las Vegas Sands is the better buy today: Even if Macau grows, the company will see upside, but without the kind of risk that Wynn Resorts carries.